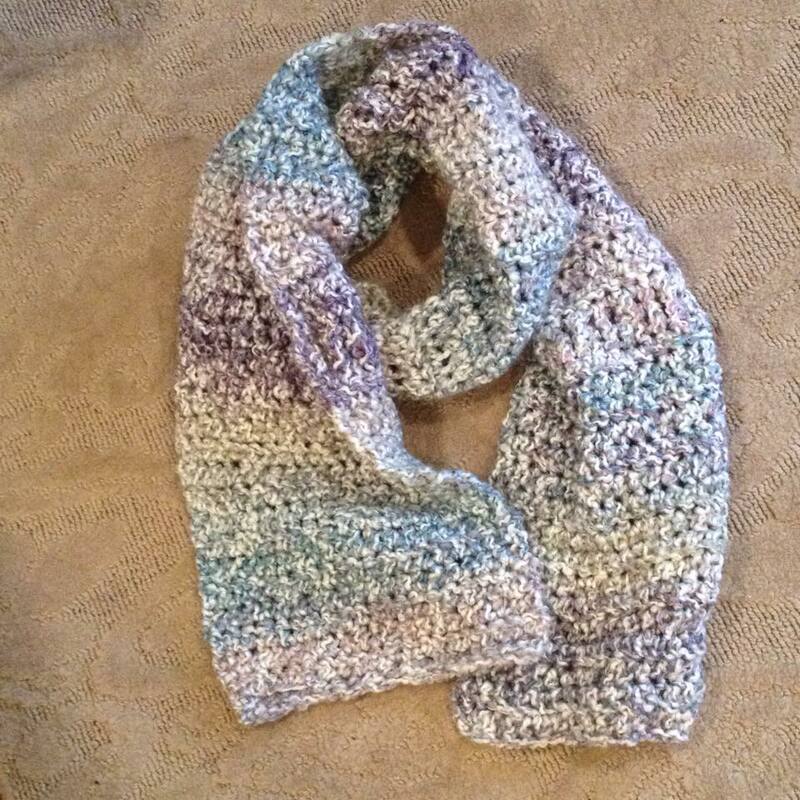 Introducing for free, my very first crochet pattern! 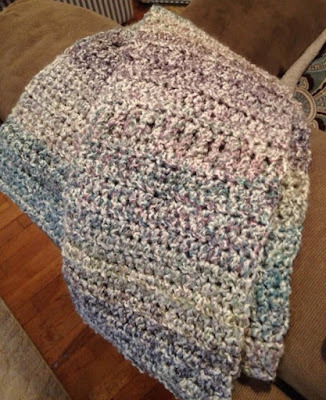 Often, I modify crochet patterns I use, and even make up my own projects as I go, but this is the first time I've written out my own original crochet pattern to share publicly. 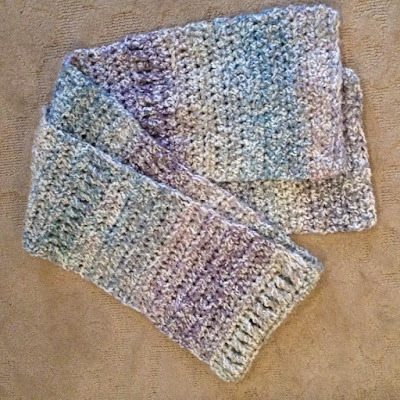 I'm excited to give you this adorable, and very warm scarf. 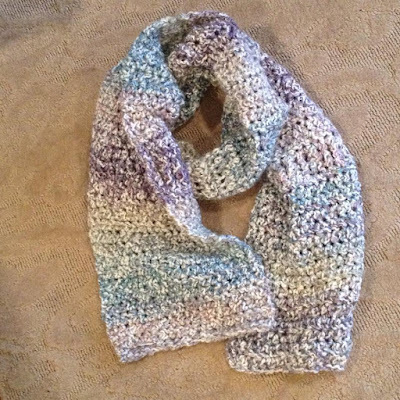 The gently variegated colors of this particular yarn lend themselves beautifully to the subtle repeat of the Cross My Heart Scarf, so named for the rows of X's in the pattern. 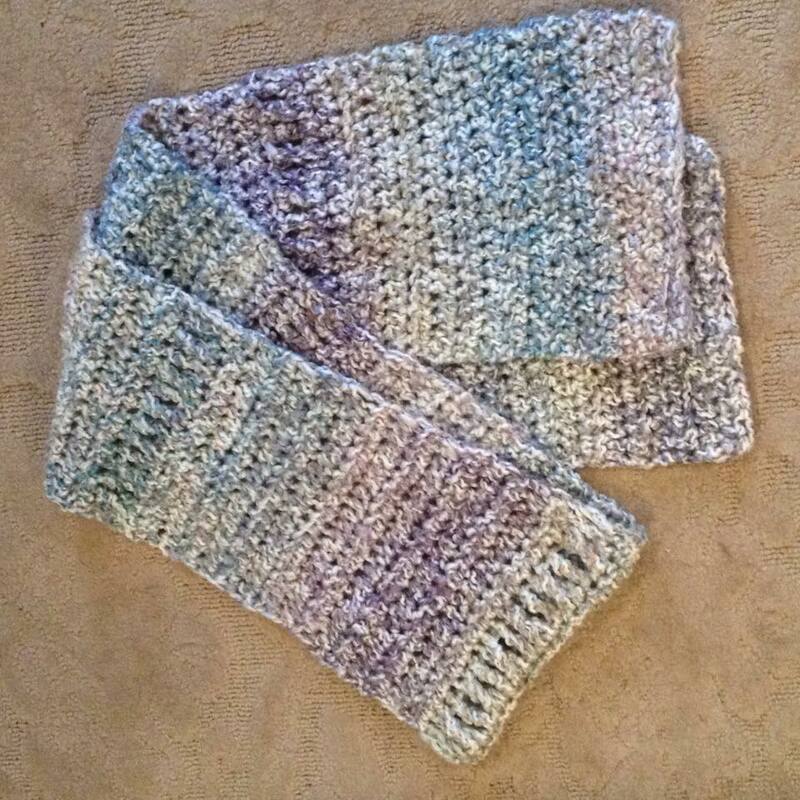 This soft scarf is extra wide and the perfect length to wear snugly wrapped over, or under your coat this season. It's worked in a repeating pattern consisting of half double crochets and treble crochets which are stitched to form X's. The homespun yarn is an unwound strand of acrylic yarn wrapped with a tiny string, so when worked it gives a soft and fluffy appearance. This does not work well for every pattern, as it's hard to see the loops of the stitch. I bought the yarn for another project but found it was not suitable for that particular pattern. 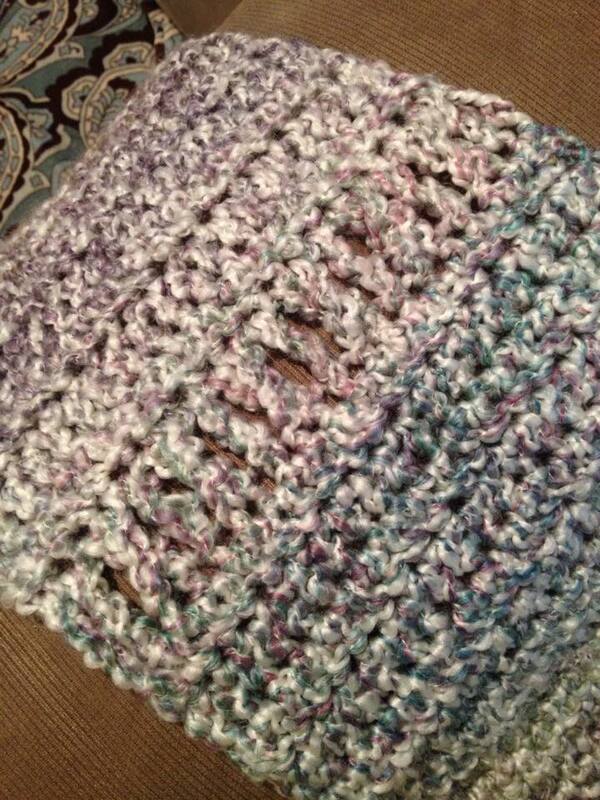 So, keeping it simple, I started to work half double crochets to see what the color variegation looked like. I kept working in rows of 20 and realized the potential, thus the Cross My Heart was born! As a happy accident, the rows of 20 seemed to fit perfectly with the changing colors in muted hues of blue, purple, mauve, teal and taupe. Beginning any project with a chainless foundation crochet is a miracle time saver and a must-learn technique for any crocheter who dislikes endless chaining and tediously working into each chain. 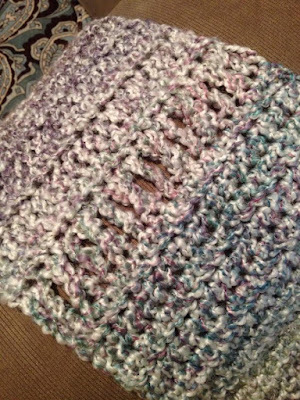 Foundations can be made in almost any stitch and are fairly easy to get the hang of. I learned by watching you-tube video demonstrations. Simply search for "chainless foundation crochet" and a number of videos appear to help you fsc, fhdc or fdc. I try to begin most projects with a chainless foundation, even when not called for. I couldn't even imagine chaining 100, 200 or more to start an afghan or other large project. It has more stretch and gives like a regular row of crochet, where chaining does not- especially good for garment making. If you've never tried it before, I urge you to learn. Please feel free to comment and ask questions or point out any ways I can make this pattern better. If you'd like to OWN this pattern, a sleek, printer friendly, portable PDF version is available here for a mere $1.50! Thank you for supporting Haute Kippy! I heart You! 1. Use two skeins from the same dye lot if using variegated yarn to ensure color continuity. When joining new skein, pull new yarn out to match color on hook. Cut and ball pulled yarn. Joining with matched colors keeps the variegated pattern consistent across rows. 3. Row 16 repeat: When making X's, crochet 2nd tr on top of previous tr as follows: yo twice to begin tr, insert hook into skipped st and before next yo, move previous tr behind hook, then complete tr. The starting ch 3 does not count as a bar in row total stitch count. Rows 33-95: Continue with pattern established (15 rows of hdc, one row X's and bars) 4 more times, ending with 15 more rows of hdc for a total of 95 rows or to desired length.